High cliffs, jagged rocks and the churning waters of the Bay of Fundy make up the coastal scenery on Grand Manan Island, New Brunswick from Southwest Head. From Southwest Head on Grand Manan Island in New Brunswick, Canada, the coastal scenery is beautiful as the jagged edges climb up the high cliffs leaving the boulders below being beaten upon by the fury of the water. The fog spans across the horizon leaving the visibility of the scenery limited but the beauty of these rugged cliffs with little protection from the sea show off their unique formations. 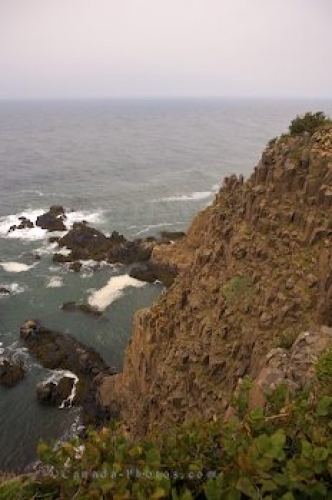 These cliffs rise from 200 feet to 400 feet above the sea with small tufts of greenery sprouting in various sections. The island is 16 miles long and 11 miles across with various communities scattered along the coastal regions. Heritage trails and footpaths located across Grand Manan Island, like the one at Southwest Head, are one of the only ways to view some of this coastal scenery as most areas are not easy to access by vehicle. Grand Manan is the largest island in the Bay of Fundy with a population of approximately 2,500. Picture of the coastal scenery of Grand Manan Island, New Brunswick from Southwest Head.